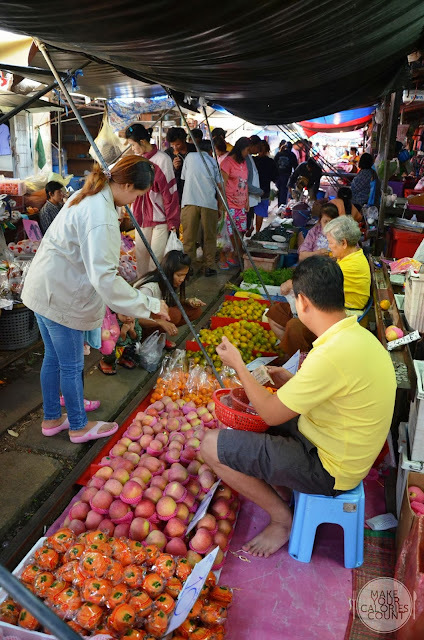 [BKK] Maeklong Railway Station - unique marketplace for fresh produce! 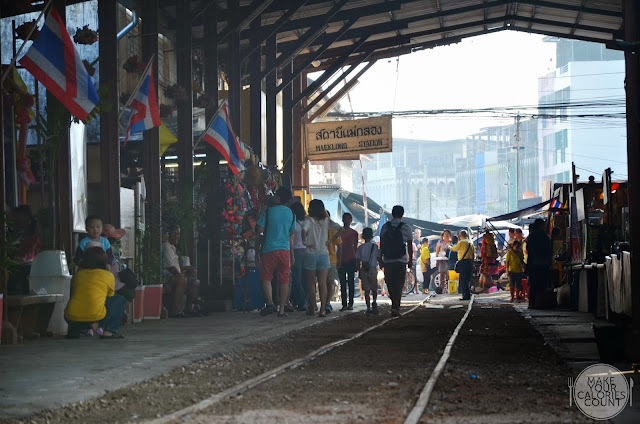 I am sure we have all visited a market of some form at some point in our lives, but how about a marketplace that is located right beside a railway track? It was an eye-opening experience and certainly one of the highlights in our recent trip to Bangkok! 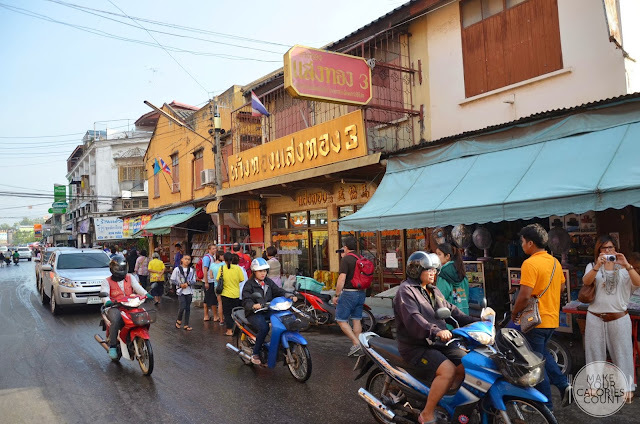 We bought a Groupon deal for two persons which came to S$58/- which included pick-up and drop-off from our hotel in Central Bangkok to the Maeklong Railway Station and also in the later part of the itinerary the famous Damnoen Saduak Floating Market. A well worth experience and I must say it was pretty value for money, considering the journey to both places was about an hour out one way from Bangkok itself. The only downside to this was that we had to wake up really early since pick-up from hotel was anytime between 0700 - 0730 hrs (depending on the guide's pick-up schedule, though we were lucky to be given the 0730 hrs slot) and we travelled to our destinations in an air-conditioned mini-van. I will be discussing our experience to the Damnoen Saduak Floating Market in a separate post. 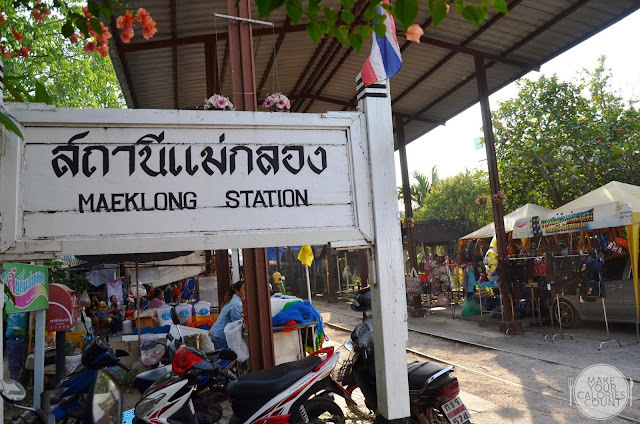 Like all tour guides do, allow me to be your virtual guide and feed you with some background information about Maeklong Railway Station! It runs for nearly 67 km between Wongwian Yai, Bangkok and Samut Songkhram in Central Thailand. Constructed in two phases, it was first founded in 1901 and later merged in 1907 to form the current Maeklong Railway which was originally opened as a goods line, transporting produce from the fishing ports of the peripheral regions such as Samut Sakhon and Samut Songkram to the Bangkok markets. After being dropped off by the tour guide, we were at the end of the railway track when we started our 'by-foot' expedition of the market, let us unleash the explorer spirit! We started with some light food from one of the first few stalls upon alighting. This was a beautiful dessert that is guaranteed to give you a refreshing burst. 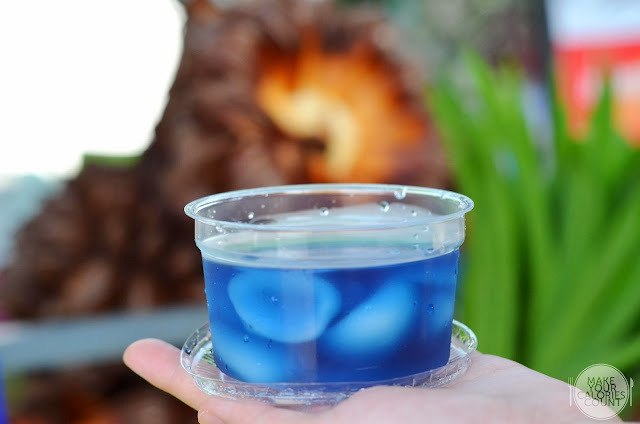 Served ice-cold, the chunks of sea coconut were soaked in sweetened blue flower solution. While she sensed my hesitation in trying, she popped one of the blue flowers into her mouth and happily munch on it while kindly offering me to do so. This was good enough for me to return for a second helping and can you resist since it was really affordable at just 20 THB per serving! 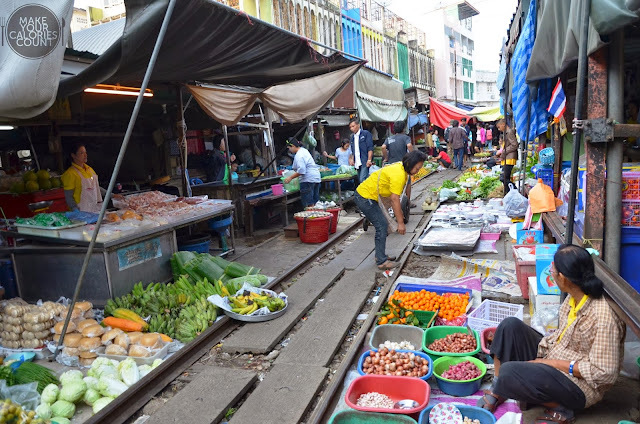 Market vendors were seated just by the railway tracks with buckets of their produce ready to present to customers from all walks of life, be it tourists like us, wholesale buyers or even mums doing their regular grocery shopping. 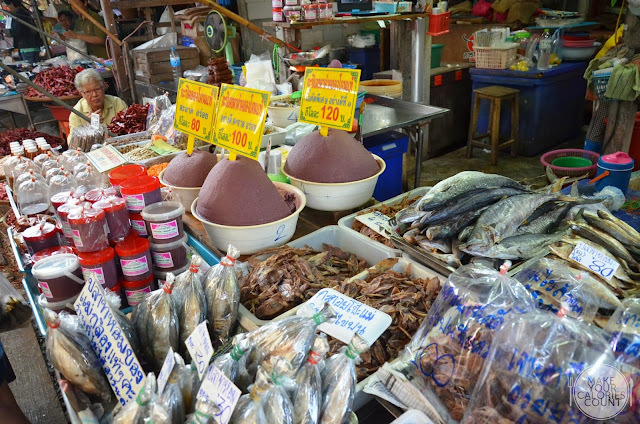 Priding itself for being one of the largest fresh seafood markets in Thailand, expect to be greeted with plenty of stalls selling fresh and dried seafood, poultry, fruits and not forgetting their famous spices! 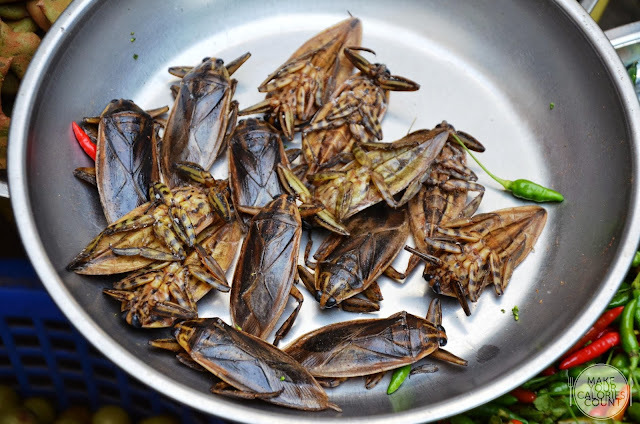 Some appetiser for the adventurous? 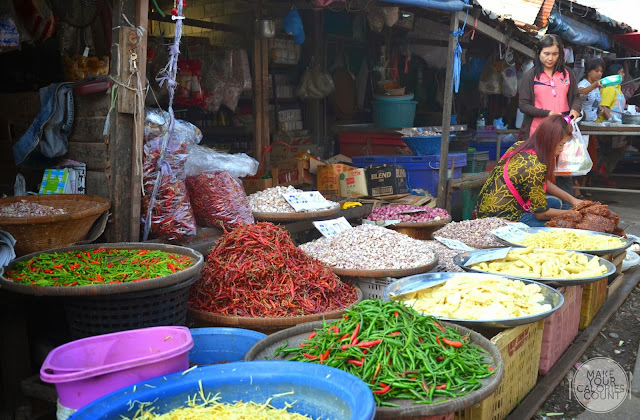 Upon coming to the end of the market, we decided to cut through one of the narrow alleyways located parallel to the railway track and ended up at aisles after aisles of shop houses and vendors selling freshly prepared food. 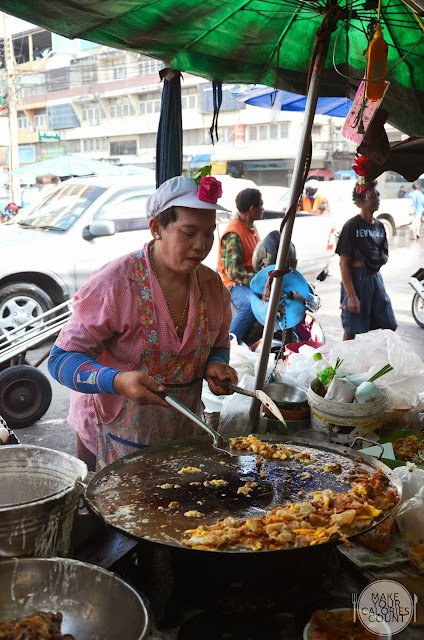 I had always thought about roadside food and thought that it would be interesting to try but when it came to seeing these hawkers upfront and their food preparation methods (i.e. expect minimal hygiene), we were slightly deterred and passed on a few seemingly good treats. After all, we want to make our calories count but not sacrificing ruining a vacation with food poisoning. 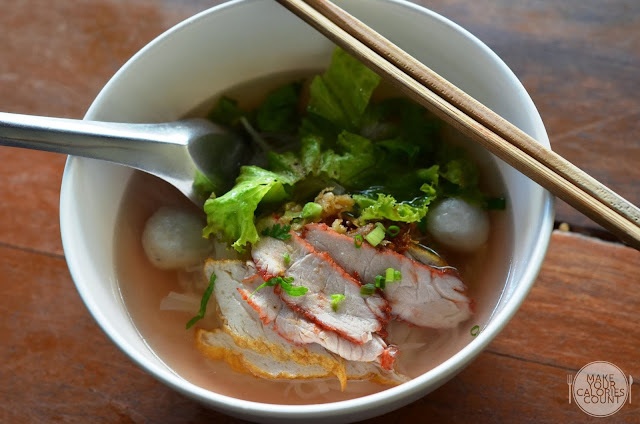 A mister/missus passionate about serving his/her plate of Thai-style radish cake! 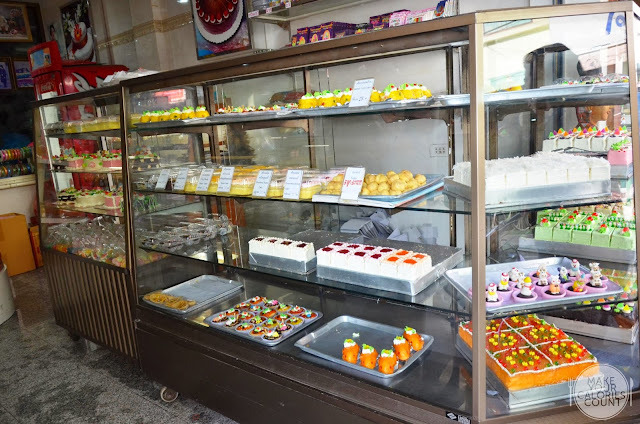 Any bakery, especially old school ones would never fail to attract my attention! While we realised that our stomachs were starting to growl, we sourced for the only decent eatery we could find along the stretch of food vendors and chanced upon this noodle place opened by a Chinese, or at least we could decipher the name of its signboard to read 新光. 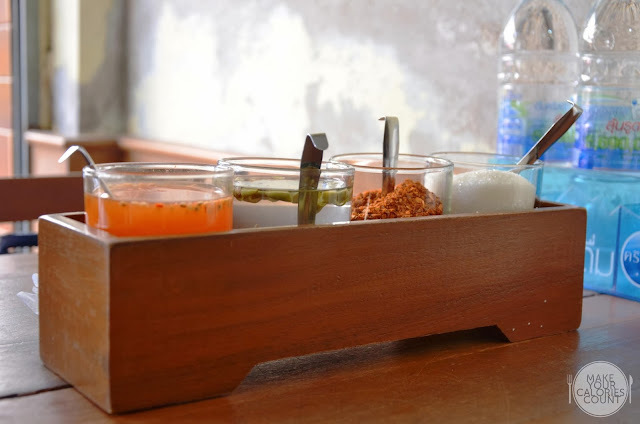 Served with a tray of condiments neatly arranged, it seemed like common fare to have fish sauce, chilli sauce, dried chilli flakes and sugar to be served whenever you order any soup-based noodles dishes in Thailand. This was one of the most unpretentious meal we enjoyed during our holiday not just because it was priced just below S$1.20 for this bowl of goodiness but the service was good and staffs were polite. The light broth was spot-on in terms of flavours and enjoying the bowl of noodles felt homely more than anything else and if it helps, it was a lot cleaner than most of the vendors out on the streets. 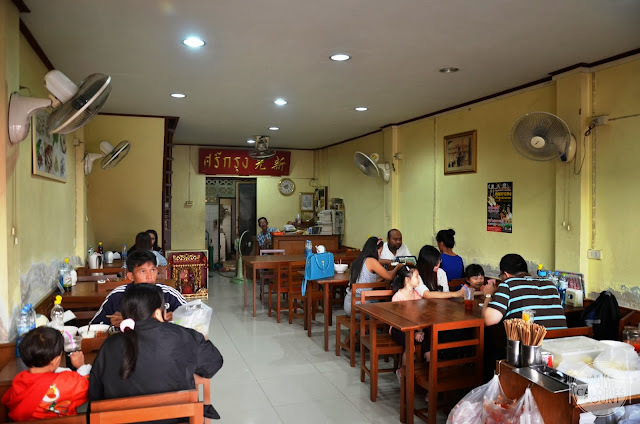 By the time we were done with our breakfast, it was almost time to return to the tour guide for our next leg of journey to the Damnoen Saduak Floating Market but before that, it seemed like a train was approaching the Maeklong Railway Station! We did not manage to get a video where the train went past but here is one which we sourced from Youtube which should give you a good idea of how it feels like! It is unique because whenever a train approaches, the awnings and shop fronts are moved back from the rails (expect some squashing for those vendors who were not fast enough to bring their produce in), only to be replaced and life continues after the train has passed. 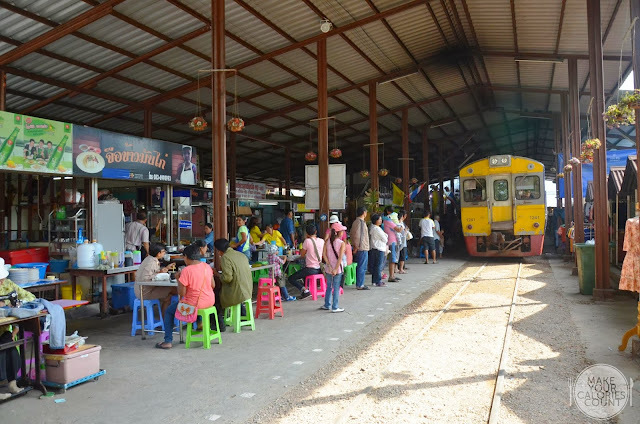 It was surely a memorable experience to visit the Maeklong Railway Station and credit goes to Bangkok 2 Tour, especially Danny (Singapore contact) and Tiger (Bangkok contact) for the seamless arrangements to make it a very fruitful and insightful trip. Danny was the person to liaise with in order to book our slots for the trip and he was prompt in replying to emails (within the same day) and Tiger was responsible for the logistics end over at Thailand. I received a reminder text message from him two days before my booked date and you will be expected to revert with a confirmation reply. For the rest of the journey, leave it to the folks who would warmly greet you at your hotel lobby! 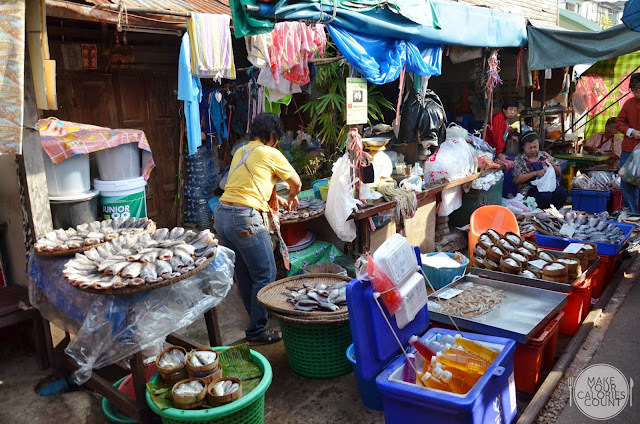 Stay tuned for our post on the Damnoen Saduak Floating Market, an experience in Thailand not to be missed! Thank you for dropping by our humble blog and the kind compliments. Glad that you found our post useful! We actually purchased a Groupon deal package listed on the Singapore's site for S$58. Just ran a check and realised that it was sold out now. We did not actually visit any of the shows listed in the url you listed. 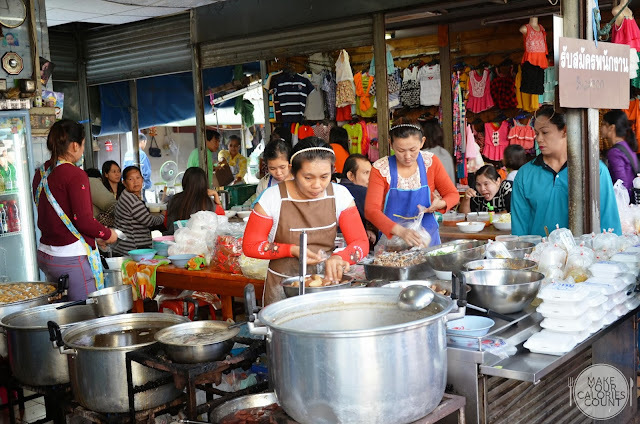 Our itinerary was rather basic; the tour guide picked us up from hotel at 7.30am, took an hour via a mini-van to Maeklong Railway Market, spent about 45 minutes there and went to Damnoen Saduak Floating Market which was about 15 minutes away. Went on the canal trip in a paddle boat and the trip summed up by noon time and the tour guide drove us back to the hotel. That was pretty much it! No harm dropping them a line to see if they still cater for such an itinerary? Hope this helps! [SG] D'Good Cafe | perhaps overrated? [Event] #GivingTuesday - A day of giving!